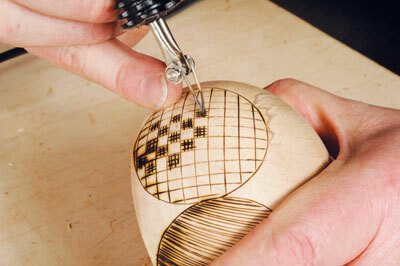 Pyrography is becoming ever-more popular, and it should come as no surprise that people have pushed the boundaries of many of the available units, resulting in manufacturers producing more sophisticated machines that are able to deliver more power. The in-turn can cope with not only the fine detail work, but also the heavy-duty scorching and incision work that is now being undertaken. This all-new Fire Writer unit, available from Woodworks Craft Supplies claims to be 'the newest and most technologically advanced pyrography machine available'. So with such a mighty claim, I was only too pleased to put it to the test. The unit is compact and looks to be very sturdy. It has an on/off switch on the back side of the unit, a speed-control dial with settings 1-10 and a couple of handpiece holders. It is light enough to move around if you want it in a different position, but is heavy enough so that it will not shift about unnecessarily when using the handpiece. This unit is sold with a pen with two clamping points at the end of it that accepts any pre-made or self-made wire tips in 16-22 gauge wire. The handpiece has an extra-long supply heavy-duty lead. The pen can be swapped for a new one by removing an insertable pin which fits in the main body of the unit. 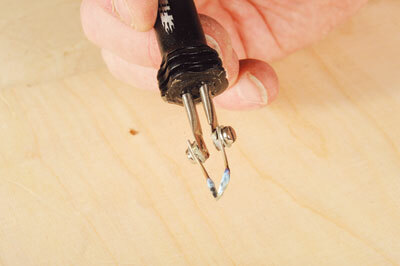 It comes with lengths of different grades of wire so you can make your own nibs. You can also buy an optional splitter connection that allows you to have two pens connected all the time. I found that the handpiece could be held very easily in the hand; a few other people tried it and found that they too had no problem holding it comfortably. I fitted and used a variety of homemade nibs and a wide selection of pre-made ones, such as scalpel and feather burning tips and found that the fitting of the nibs is easy. Just undo the locking screws, locate the wire ends in the gap and clamp in place - secure and simple. I wanted to see if I could 'heat sculpt' work. This is usually done using a high heat setting, but is dependent on the work being undertaken and how fine the tip used is. In this case a scalpel tip was used and work was incised to great depths. I was able to incise and cut through birch-faced ply like a knife through butter. 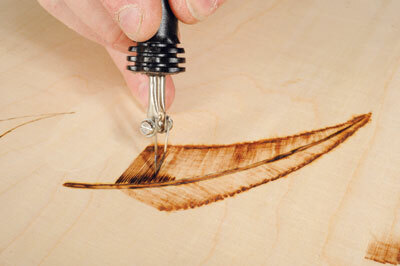 This technique can be handy when piercing small work and creating fine detail like hair and feathers, which seems to be used more often of late. Even at the high-heat settings, the handpiece remained comfortable to use. Suffice to say the Fire Writer copes with the heat without any problems at all and, as such, it breezed through the fine detail and shading techniques I also tried. I found this unit to be well made and a joy to use. The price is very reasonable and, in my opinion, outperforms some of the higher priced units available on the market today. 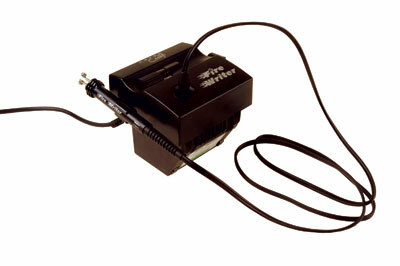 This Antex unit is compact and sits nicely on the bench, although it is a touch unstable. The heat setting range is comprehensive and tip temperature changes quite quickly when adjusting the dial. The lowest setting is an ultra-light heat output and I found myself using the mid and highest settings for the quick and effective results I required. The handpiece is comfortable and lightweight and agreeably warm in use. Of course, the actual results vary depending on whether you use wire or a blade-type tip, but it does give good results and I would be happy with using the Fire Writer on a daily basis.